We had been talking about a trip up to the Old Man of Stoer for about six years. This year we decided to just book some flights for mid September and hope the weather was favourable. We had a five day trip, giving three potential climbing days. Initial optimism in the forecast turned to look more like a washout, but we decided to take the risk and fly to Inverness to see how it went. 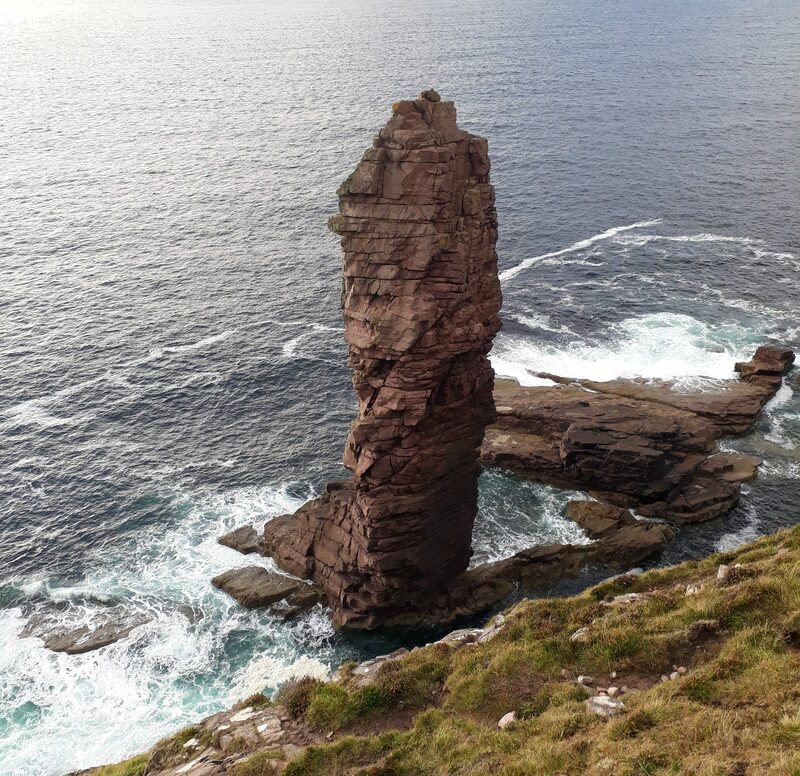 The stack is located about 2.5 hours drive from Inverness, along winding roads that make part of the North Coast 500 – ‘Scotlands answer to route 66’. 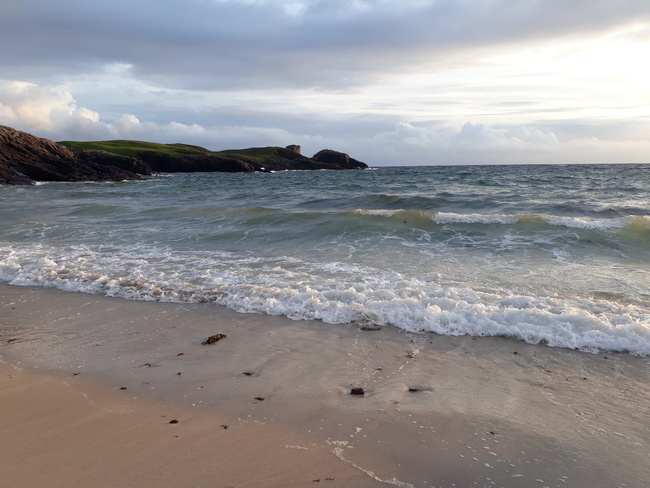 We stayed at the picturesque Clachtoll Beach campsite, which is next to those white sandy beaches that you only find in Scotland, and Thailand, apparently. Day 1 weather was forecast to be awful, and it was just that, but we decided to at least go and look at the stack, and see if the tyrolean traverse line was in place. The walk in was extremely boggy, and attempts to skirt round only resulted in even wetter feet. 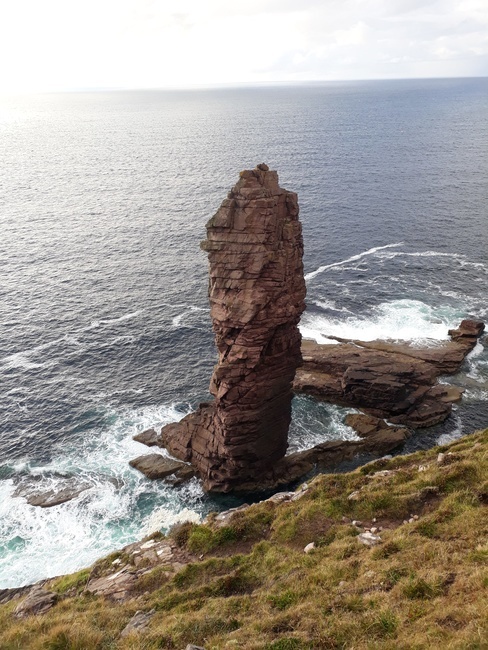 The first sight of the stack was an inspiring sight, and as we got closer we could see that no traverse line was in place, we’d have to do the ‘full sea stack experience’ and set up our own. Considering we were already wet, it made sense to set up our own. The descent to the stack feels a bit like stepping off a cliff, and would be far easier in the dry, but feels like a slightly sketchy scramble. Once at the bottom, I got ready for the swim (being the most accomplished swimmer out of two poor swimmers) and made my way across the narrow channel, with the rope and a drybag . The water was actually not too bad, and after clipping the middle of the rope to a stack using some cord and some in-situ gear, Saz tensioned the line and I tested it on the way back to dry land. We retreated to the nearest town for beer, fire and local seafood, and keep our fingers crossed for the next day. The next morning was wet, and after a few hours of sitting in the van and fighting with the campsites surprising, but unreliable wifi service, we geared up and got going. The walk in was boggy but at least we knew the way, the showers were persistent and the Old Man looked rather damp. We descended the wet scramble once again in drizzle, but remarkably, as we set foot on the platform at the bottom, the rain stopped, the clouds parted and the sun came out. Luck was on our side. The tyrolean hadn’t disappeared in the sea overnight, and so we tyrolean-ed and I began the route, which is a VS on the Original route, starting with the 5a traverse pitch, which is usually damp, and this was the case. 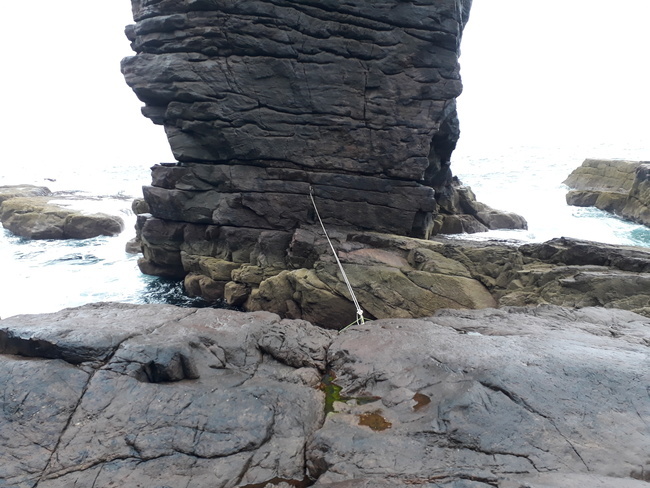 So slimy was the horizontal groove that I quickly and shamelessly resorted to aid climbing, getting us to the start of the second pitch relatively quickly, and preferable to waiting another hour for the tide to do the scramble round and avoid it. 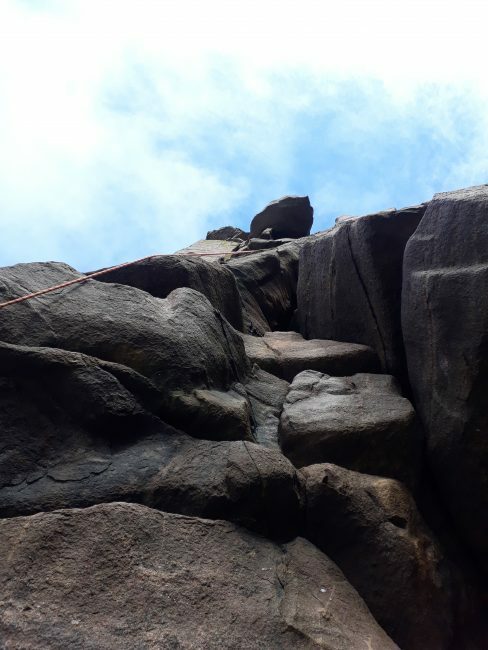 Saz took pitch 2 which really gave a feel for the wonderful grippy rock that felt quite gritstone-y to me, and the weather at this point was calm real and sunny. Pitch 3 was in my opinion the hard pitch, plenty of gear but burly moves on big rounded holds, as you zigzag your way up the south face of the stack and reach an amazing thread belay. Pitch 4 traverses round onto the landward face, and isn’t as easy as it appears. Pitch 5 takes on a v- shaped groove that is really obvious from the land, is slow to dry and so I found it quite exciting, the rest of the pitch is more straightforward as you reach the large ledge just below the top. At this point you come to be level with the cliff which if you are lucky might be full of cheering spectators, (but it appeared that our heroic ascent had gone unnoticed) Once Saz had reached the top a short scramble puts us at the very top of the stack, with amazing views down every side and back to the land. 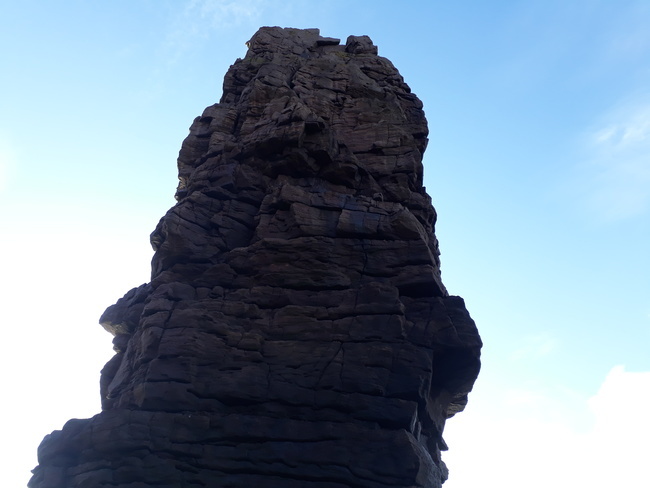 The shadow of the stack gives a brilliant perspective of the structure on which we were standing on, and a real feeling of achievement for climbing one of the UK’s most unique rock features. 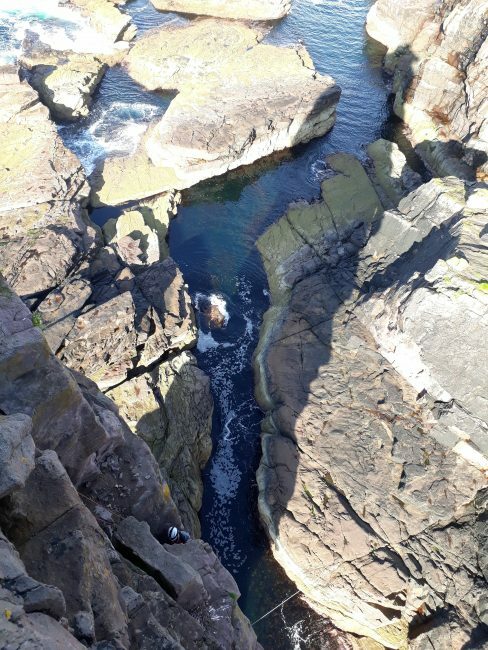 We climbed with 50m ropes, and were lucky to find that our ropes made it all the way down with centimetres to spare, rather than having to use the very suspect looking intermediate abseil point. The 50m abseil is free-hanging and exciting, and deposits you right back on top of the tyrolean. We had climbed fast enough that the tide hadn’t yet come in, which was lucky as the tyrolean had lost a fair bit of tension during the day, we suspect from drying out in the sunshine. We made our way up the scramble and walked out triumphantly as the evening sun began to dip. When we returned to the van, we thought for a moment that someone had left a note, it turned out they had, it was from the lady from the tea shack and included two Tunnocks caramel wafers. Well deserved. 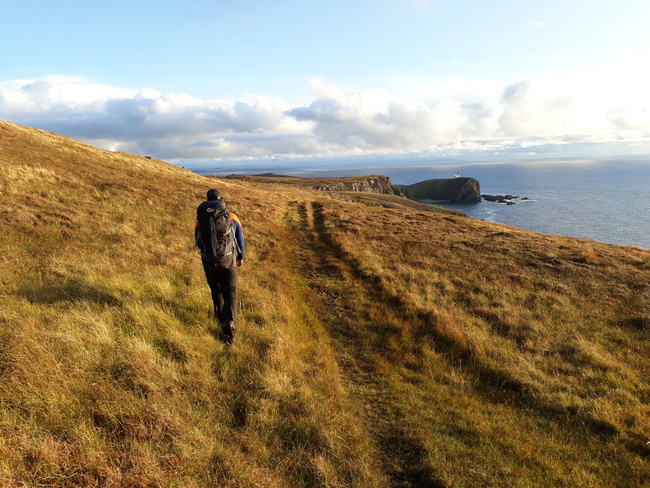 All in all a fantastic adventure and worth taking a trip up to see a remarkable piece of UK coastline. 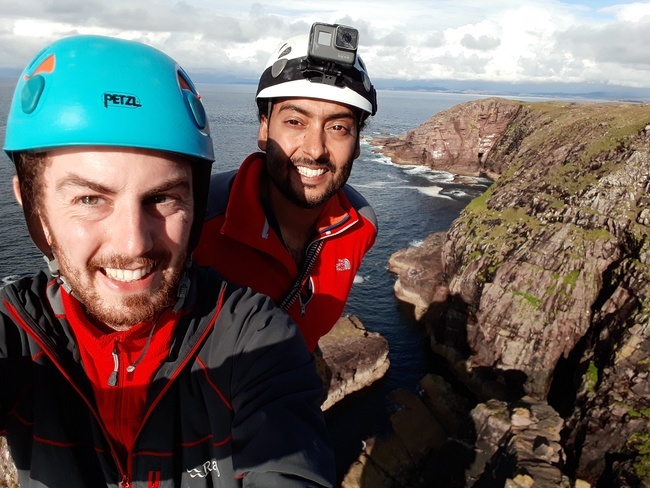 We spent the third day doing short seacliff trad at a crag called Reiff – a great place for a ‘rest’ day, even though the weather wasn’t great – by that point we didn’t care! This entry was posted in Trips. Bookmark the permalink.